This is my copy of a letter Governor Palin wrote for the RNC, inviting everyone to the California and Florida RNC Victory 2010 rallies. Please click the link below and spread the word! I would be grateful if you took a moment from your busy schedule to read the attached message from RNC Victory 2010 Chairman Peter Terpeluk. Once you have finished, I hope you will order your tickets to join me at an RNC Victory 2010 rally in Anaheim, California on October 16th or in Orlando, Florida on October 23rd to kickoff our Party’s final push to victory. RNC Victory 2010 is leading our Party’s get-out-the-vote effort and providing direct financial support to candidates from the county courthouse all the way to Congress. Our candidates are counting on RNC Victory to pull them across the finish line — and I’m counting on you to play an active role. Thank you for your time and for all that you are doing to bring conservative leadership back to America. 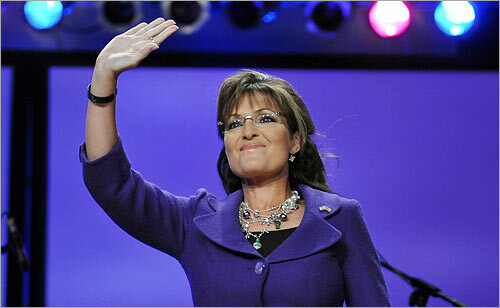 Palin More than Qualified to be President retrieved from PalinTV. Gov. Palin has nearly 20 years of executive experience in positions of increasing responsibility both in the public and private sectors. As Governor, she held command over the 49th Missile Defense Battalion and the Alaska Defense Forces. As Governor, she also was deeply involved with international trade and foreign policy; meetings with consuls, diplomats, and foreign leaders were routine business for her. Nicole Coulter provided an excellent synopsis of Gov. Palin’s qualifications here. Last night, Governor Palin spoke at a Women of Joy event in San Antonio, Texas. She addressed a large audience of Christian women. A friend of mine was among them and remarked how encouraging the message was and what an impact it had. Apparently, the Governor discussed being an overcomer rather than a victim. In her typical ability to make light of situations, she also joked about the ridiculous rumors that she and Todd were headed for divorce court. Organized by the Alabama-based Phil Waldrep Evangelistic Association, the event runs through Sunday. Waldrep said in a written statement that the event was meant to be nonpolitical. “It is simply a gathering for Christian women to rejoice in their faith, renew their spirits and fellowship with their sisters in Christ,” he said. Former Alaska Gov. Sarah Palin thrilled a crowd of evangelical women Friday night in San Antonio, spiking her talk on overcoming obstacles with barbed references to the media and her critics. Instead of delving into the conservative, tea party-tinged politics she is known for, Palin largely focused on the themes of religious faith and family. The GOP’s 2008 vice presidential candidate offered no hint of whether she is looking to run for president in 2012. Still, she took a veiled swipe at President Barack Obama, telling the audience, “All of you (are) just proudly clinging to your guns and religion.” She was referring to comments Obama made during a fundraiser in 2008. Palin then turned to the idea of American exceptionalism. Her nearly hourlong talk was the main event of the Women of Joy conference’s opening night at the Convention Center. She also talked about the challenges of having a son, Trig, with Down syndrome, and how religion helped her come to terms with it. Insinuating that her words almost certainly would be wrenched out of context, she said she looked to the audience for support. I wasn’t in the audience last night, but I’m definitely one Christian woman who has Governor Palin’s back. Her fight for this nation comes from a deep belief that God has truly placed His hands on America, called America to greatness, and therefore, America is worth standing up for–and so she does. I stand with her.